The entire Blandford, Massachusetts, police force has resigned because of poor working conditions, according to WGGB-TV. According to WGGB, Blandford’s interim police chief and three officers who made up the force resigned without apparent warning this week. The news outlet reported that the officers resigned because of poor working conditions. The outlet reported that some of those conditions included inadequate staffing, improper radio communication systems, mechanical issues with patrol cars, poor bulletproof vests, and issues with wages. “We regret leaving the town without a town police force, but we have no choice given the situation that we face,” a portion of the statement said. For the past two months Interim Chief Sarnacki has done a fine job with our police officers and our police department. It is unfortunate that she led this officer walk out as she would have been considered as one of our candidates for Acting Chief position as we pursue the future opportunities with our police force. We have had multiple public meetings with our police force and have offered them the opportunity to engage and provide their opinions for the direction of the force. We have reached out to our neighboring communities to insure the safety and security of our citizens. Until such time residents should continue as normal to dial 911 in the event of any emergency and local or state assets will be dispatched to assist them. 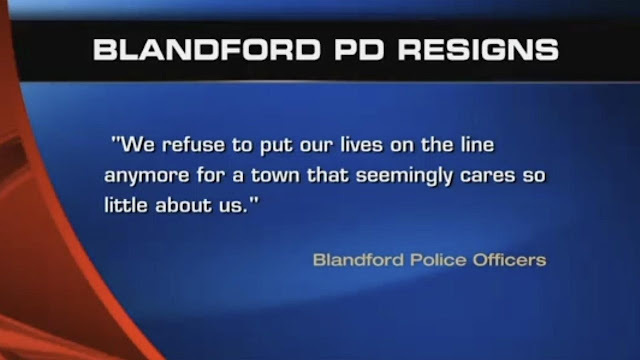 The Town of Blandford is continuing its already posted search for a new Police Chief. Later on Monday, the Blandford Police Department issued a statement on Facebook noting that local residents should continue phoning 911 in the event of an emergency. The posting also referred residents to call the Massachusetts State Police for other police-related issues. According to WWLP-TV, talk of Blandford combining its police force with neighboring Chester occurred just last week. The outlet reported that the towns of Blandford and Chester held a joint selectboard meeting last week to discuss the creation of a regional police department.